2065. A Floating City. Unexplained Powers. Sky City. Billed as the most perfect place on earth. It floats a mile above the surface, leisurely circumnavigating the globe, a favorite vacation spot for the wealthy. Its king: an alien-being shrouded in mystery. Residents and visitors alike are compelled to follow his rules, an enchantment placed upon them. 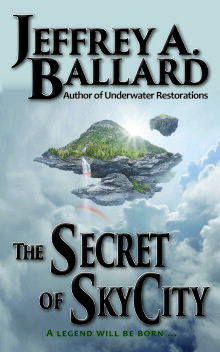 All except for Jena Alwen—a first time visitor, and the thief contracted to steal: The Secret of Sky City. In this short story, Jeffrey A. Ballard, a classically trained scientist, pens an exciting tale you won’t soon forget!